It came this morning via the posty. Its in a cute little tin with a ribbon on it. ... and I am itching to start it..
Just the perfect gift for Christmas for someone special..
in the shop to recieve the daily deals via your email. They come once a day and must say there have been a many a good one..
all is quiet in my house cos everyones asleep. 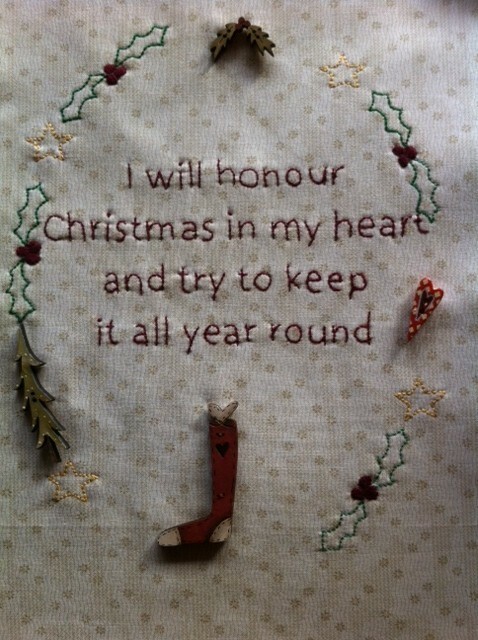 That is so darling - enjoy your stitching, lovely Dawn! A lovely kit. Fee's shop is great. I love that quote. It is so very true and heartfelt! One time I listened to a radio station that placed Christmas music on the 25th of every month. Their reasoning was that the joy and good will shown by people at Christmas time needed to be brought to mind once a month!